Stefano Pioli’s Inter hosted their fierce rivals in the Derby di Milano on matchday 32 of Serie A, a clash filled with drama right until the very last kick. Back in November, Pioli experienced a baptism of fire as he took charge of his Inter side for the first time in the reverse fixture which also ended 2-2. Both clubs have fallen from grace in recent years, but AC Milan’s new Chinese ownership – announced two days prior to the fixture – will have been delighted with their new club’s late comeback. Inter’s ability to isolate Romagnoli coupled with Milan’s inability and unwillingness to play through the press took the hosts into a 2-0 lead at the break. Inter were direct in possession with a clear vertical focus, attempting many long diagonal balls and crosses, and mostly looked to build play down the left-hand side. One reason Inter’s strategy proved effective was Carlos Bacca’s lack of defensive nous. The Colombian striker’s inadequate positioning and awareness meant he had rarely had access to Inter’s centre backs and failed to cut off passing lanes to deep midfielders, resulting in a lack of pressure on the ball and thus Inter’s deep players frequently had time to hit direct passes to their attacking trio. This was evident in Inter’s first goal – after pressing Medel into a long ball, Bacca failed to readjust his positioning as the ball came back to Inter’s defence, which afforded Miranda time to play to Gagliardini, who also had enough time to receive the ball facing forward in the right half-space. The young Italian displayed great perception-action, quickly receiving, turning and playing a long ball in behind De Sciglio for Candreva to dink over Donnarumma. As part of their offensive strategy Inter seemingly targeted Milan’s right back, Calabria, by using Perisic, and how they did so varied and depended on Nagatomo’s positioning. If Nagatomo stayed deep in build-up this attracted Suso higher up the pitch and left Perisic with more space to work with against Calabria. With the young right back slightly isolated and Perisic physically dominant, the Croat could be found with long balls and Joao Mario’s tendency to drift towards the left facilitated link-ups and also occupied Zapata, leaving Icardi 1v1 with Romagnoli. On a couple of occasions if Nagatomo was positioned higher in build-up play he would quickly make an intelligent driving run into the left half-space, which had numerous benefits. Firstly, the run initially dragged Suso infield, opening the passing lane to Perisic. Secondly, the diagonal nature of the run produced a dynamic advantage in that he would be able to receive the ball from Perisic facing forward and at speed, which would make him a direct threat to Milan’s defensive line if he were to receive. Thirdly, the run occupied Zapata and dragged him across to the flank, again leaving Icardi 1v1 with Romagnoli. Inter’s second goal came about after a sequence of defensive errors from the away side, again largely from a lack of effective pressure on the ball. Kucka situationally pressed Miranda, forcing him to pass wide to Nagatomo. Nothing largely wrong there. However, Bacca failed to compensate for this and didn’t look to balance Kucka’s movement. Nagatoma played a square ball to Kondogbia which triggered Suso to press, leaving a gaping hole between Milan’s midfield and defence. The ball shortly came back to Miranda who had noticed the large space and played a lofted ball to Joao Mario, who was engaged by Zapata, but this left Calabria and Romagnoli in 1v1 situations behind him. Mario flicked the ball on to Perisic who played a one-two with Icardi to get in behind Calabria before getting to the byline to deliver a sweet low cross to the onrushing Icardi, who duly finished after getting on the blindside of hapless Romagnoli. There were a number of reasons that, besides in the opening two minutes, Milan struggled to create chances through effective use of possession in the first half. First of all, Inter implemented their defensive strategy effectively, forcing recoveries in wide areas through maintaining a heavy central presence. In an initial 4-4-1-1 shape, Icardi would focus on restricting Milan’s access to their deepest midfielder as well as putting pressure on the ball. Joao Mario would follow Milan’s ball-near midfielder which was usually Kucka due to his left-sided orientation, whilst either of Kondogbia or Gagliardini would push up to prevent Sosa or Fernández from receiving and turning with the ball, dependent on which side of the pitch Milan attempted to build up from. Inter’s wingers, Perisic and Candreva, would initially position themselves quite narrowly to prevent passes into Milan’s midfield trio, which tempted Milan into making passes to the open full back. This triggered Inter to press against the ball whereby the ball-near winger would press whilst trying to keep Milan’s ball-near midfielder in their cover shadow, supported by Kondogbia, Gagliardini & Joao Mario locking on to their direct opponents, which forced either a risky pass up the line or a pass back to the defence or goalkeeper to switch play. The former usually led to a turnover due to the combination of inherent pressure from the touchline and aggressive man-orientations from Inter’s midfield, and the latter only restarted the pattern of predictable play as Joao Mario would advance to diagonally press the open centre-back to keep Milan’s deepest midfielder in his cover shadow, again funnelling the ball into wide areas from which Milan struggled to advance from. Even if Milan got their central players on the ball from wide positions, Inter usually had enough access and intensity to prevent switches and force pass-backs, helped by the ball-far winger tucking in. This was a clear strategy from Inter and it proved successful as Milan struggled to get players on the ball in dangerous positions, particularly Matí Fernández. Despite the effectiveness of Inter’s defensive strategy, Milan failed to capitalise on the inherent flaws of their opponent’s aggressive man-orientations for various reasons. Milan struggled to create free men between the lines because each of their central options were either tightly marked or in a cover shadow, which was down to Joao Mario and Gagliardini’s intelligent situational pressing. This could have been exploited if, for example, Milan tried to create a 2v1 overload in the ten space by bringing Suso or Deulofeu infield. This would essentially create a 2-2 box around Inter’s 1-2 midfield press, giving them a 4v3 overload in the centre. Inter’s man-orientation in midfield meant that when two of Milan’s midfield trio dropped deep to receive the ball they were followed and thus one of Romagnoli or Kondogbia were isolated in a lot of space, but Milan failed to capitalise on this until later in the half when their possession improved. Even when Milan had players open in positional superiority they could not be found due to their risk aversion; on numerous occasions Milan’s deep players could have found Fernández or Suso behind Inter’s press but opted to pass to the ‘open’ full backs or attempted long diagonal switches. Milan could learn from Napoli who are masters of provoking the press to create free men in positions of superiority. Hamsik can often be seen intelligently dropping in front of the opposition midfield to receive the ball and bouncing it back to attract pressure, creating space between the lines, before retreating into the space he has created to then receive the ball in a dangerous position. Leading 2-0 at the break, Inter naturally began to sit deeper as Milan’s approach became more aggressive in that they attempted riskier passes within Inter’s shape as opposed to around it. Icardi and Mario adopted a more passive approach, focusing on restricting Sosa and Kucka receiving the ball by sitting in front of them rather than pressing the centre backs. This was one contributory factor towards Milan’s improvement in build-up play as Zapata & Romagnoli were afforded more time to pick out favourable passes and Icardi & Mario were easier to manipulate than in the first half. Milan enjoyed the lion’s share of possession in the second half, albeit mostly impotent, as Inter strived to guard their lead through continuing to implement their defensive strategy. Despite the impotency, Milan did slightly improve their build-up play after the break due to the change of their shape in possession. With Suso moving inside to the right half-space from his usual wide position, and Fernández operating more exclusively in the left half-space, Milan benefited from better spatial occupation of the pitch as they now had access to central areas behind Inter’s midfield. De Sciglio operated more deeply at left back, which attracted Candreva higher and thus stripped him of his direct access to Fernández. This meant that Gagliardini became tightly man-orientated to Fernández in the half-space to compensate, leaving Kondogbia isolated, posing the question of whether he should push up to press Gagliardini or focus on Suso behind him. De Sciglio operating deeper and Suso moving inside also had the added effect of opening passing lanes to Deulofeu and Calabria respectively, conducive to their strategy of attacking via the wings with Deulofeu acting as Milan’s main outlet. However, Milan’s focus on using the wings as their main method of chance creation only played into Inter’s hands as the home side were quick to secure the centre and cut off any routes back inside. Better spatial occupation of the pitch and faster circulation of the ball enabled Milan to break through the press and isolate Kondogbia. 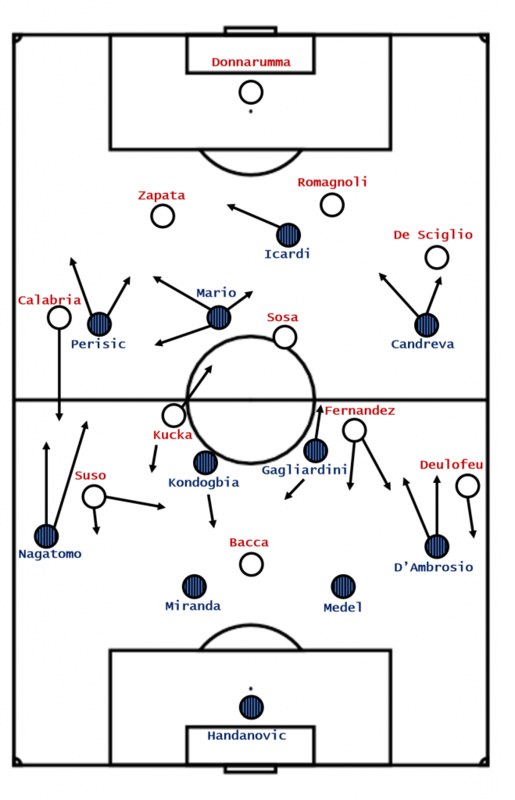 In their initial 4-4-1-1 shape Inter were still effective at forcing the ball into wide areas and cutting off central options, but Milan adapted and managed to isolate Kondogbia by provoking the press through manipulation of Inter’s pressing triggers. Sosa and later Locatelli were happy to attract pressure by receiving the ball in front of Inter’s midfield in the left half-space with their back to goal, which invited Joao Mario to mark them tightly as well as pressing the pass back into defence, opening space behind Inter’s attacking midfielder for them to receive and turn in or; through such overloading and circulation of the ball on the left, space opened for Milan on the right, however they rarely utilised this. Sosa (and later Locatelli) sometimes drifted to the left half-space, attracting Joao Mario and opening up the right half-space for Milan to progress from. Milan’s enhanced build-up, though, was short-lived. Their manipulation of Inter’s man-orientated midfield wasn’t consistent and they resorted again to playing easy passes to the full backs and long balls over the top rather than attempting to penetrate Inter’s shape. Even when Milan sought to penetrate behind Inter’s midfield, the receiver would almost always receive with their back to goal and would experience immediate pressure from a recovering midfielder or a keen Gary Medel. Inevitably the match became more transitional as Milan pushed for a goal and became more direct. Pushing players forward caused instability for Milan in defensive transition, and their lopsided shape was exploited by Inter upon regaining possession. With Calabria high up the pitch and Suso functioning more centrally, big spaces were open on Milan’s right side in transition and Inter were quick to identify this and capitalise on it. Inter had a clear left-sided focus in transition and resulted in them almost scoring a third goal in the 56th minute. Inter were the stronger team in transition due to their more stable structure and clearly defined defensive roles. Their intensity was admirable, still pressing on backwards and horizontal passes late into the game. With both teams pressing loose balls, unstable shapes and open spaces began to appear, but Joao Mario’s curved counterpressing runs enabled Inter to cut off inside passing options and make many recoveries. Inter made many recoveries through counterpressing, which was a consequence of their midfield trio’s ball-orientation in possession to provide support in wide areas. Having multiple players close to the ball meant that when possession was lost out wide Inter had immediate access to Milan’s players and stood a good chance of regaining the ball, also using the touchline to generate an extra level of pressure. If the counterpress was broken, though, there was space to exploit on the opposite side of the field. Lapadula & Ocampos came on from the bench for Milan, altering their structure to a lopsided 3-1-4-2/3-1-2-4 which provided them with a heavy central presence in the box to complement their strategy of launching a barrage of crosses into the box. Alas, their strategy came to fruition and Romagnoli scored from a Suso cross despite Inter having a 7v5 overload in the penalty area. Pandemonium ensued as Zapata scored a 97th minute equaliser for Milan from a second ball inside the box, hitting the bar and creeping over the line, verified by the goal decision system. Overall, it could be argued that Inter deserved to win the Derby di Milano due to executing their strategy more effectively and consistently than Milan throughout the ninety minutes, but poor defending of crosses ultimately led to them dropping two points. A special mention must go to Joao Mario who put in a fantastic display complete with intelligent pressing, fruitful link-up play, tireless running and speedy, effective transitions.